Drum from West Africa that is held in the armpit when played; its hourglass shape allows the tone to be adjusted by applying arm pressure to the tension ropes. Plucked string instrument used in Africa for celebrations and rituals. Elongated part of the instrument over which the strings are stretched. Piece of wood on which the strings are stretched; it transmits the strings’ vibrations to the snare head. Piece of wood to which the bottom ends of the strings are attached. Half of a calabash covered with skin that amplifies the sound vibrations produced by the strings. Piece of wood that the hand rests on when the instrument is played. Each of the notches that the upper ends of the strings attach to; they are used to tune the instrument. Strings made from gut, nylon or metal, usually numbering 21. Large chalice-shaped drum used in Africa for celebrations and rituals. Hollow cone-shaped part of the instrument that amplifies the sound vibrations produced by the hands beating on the drum. Twisting ropes used to tighten the batter skin. Stretched goat or antelope skin that is struck with the hands. 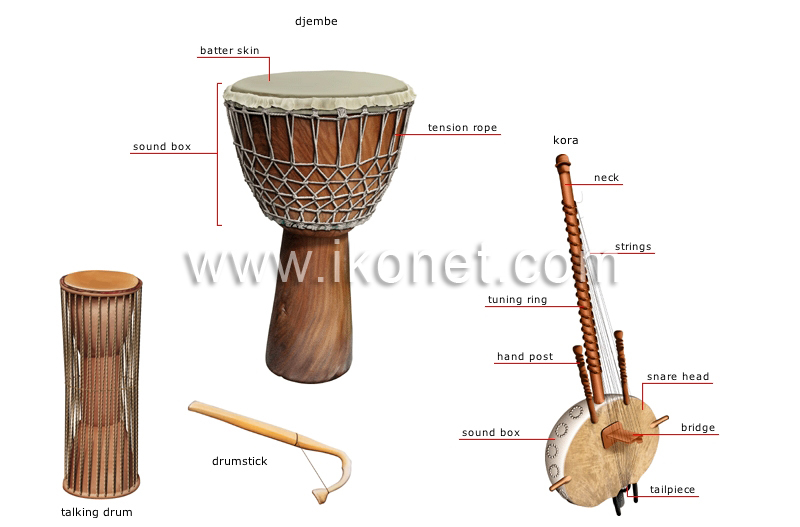 Curved stick used to strike the skin of the talking drum.